The upbeat sentiment around Crude oil remains unabated so far this week, lifting prices of the barrel of WTI beyond the 64 handle. Rising jitters over potential supply disruptions in Libya have been adding extra legs to the rally in crude oil prices, pushing the price of the barrel to the 64.6 region which is a level never seen since October 2018. However, the weekly API stock up to 4.091M barrels in April from previous 2.963M barrels. Traders now will focus on the official figure from the EIA which usually comes in the same direction with the API. 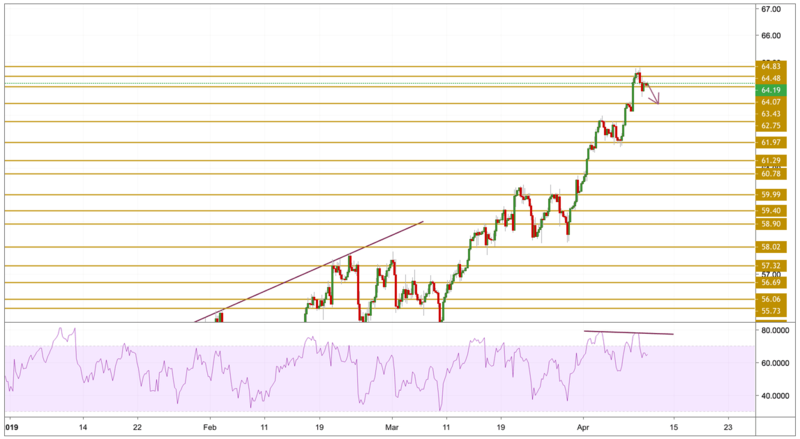 Crude oil prices lost a bit from its momentum and headed down during yesterday's session due to the divergence between the RSI and the price. There is no fear on the continuation of the upward move however we might witness a little deeper correction especially after retreating from the overbought zone. We will be focusing on the $63.43 support level on the short term.